We’re in trenches of the Summer trading period – a few months of the year where the market flattens out and doesn’t have much life it it. Bitcoin for whatever reason has been pumping to the upside. There seems to be a lot of bullish activity with it, and I am not sure why – because the rest of the Cyrpto market isn’t mirroring Bitcoin’s bullishness. 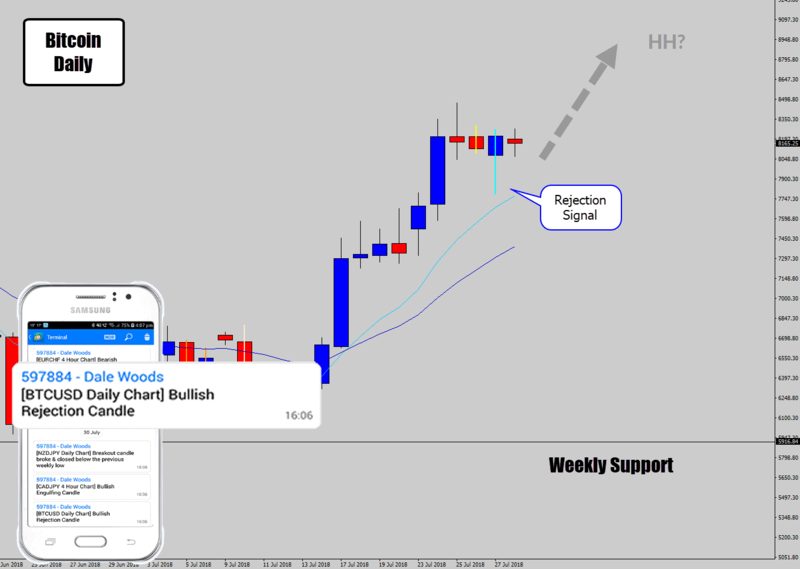 As price action traders, we’re looking to ride this momentum, and last week a bullish rejection candle dropped – a price action signal that communicates higher prices are likely to follow. My battle station chart scanner picked up the pattern also, and I shared the alert on the chart. If you want to download the trial versions of my tools you should see a box below to do so. This signal is sitting a little “high” at the moment, so that does expose the trade failing to any larger corrections to lower highs. If this momentum keeps up as it has been, there is still good upside to the signal. If the market does look to correct into lower highs, the signal probably won’t survive, but will bring opportunities to buy further signals that form off higher lows. My concerns that Bitcoin was sitting a little too “high” were warranted as the price action did see a deeper correctional move. The only way this setup was going to work was if the momentum persisted. 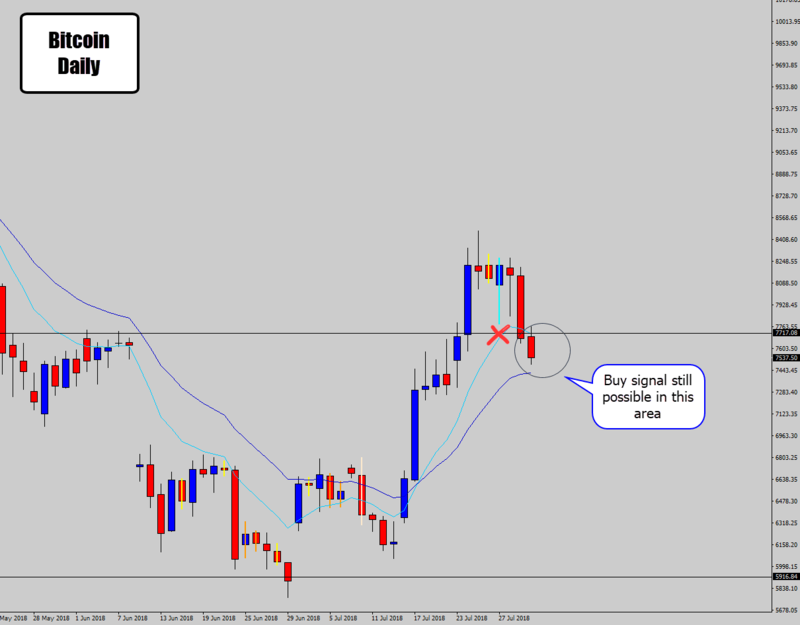 There was also more buy signals popping up on the 4 hour chart, making a bullish trade idea more attractive. Now the market has dipped lower, a buy trade is not out of the question. We will now see if strength returns at bounces price to make a higher low. This would be a more solid area to by buying into a bullish trend, but let’s wait and see if anything is printed first!